If you’re a Globe broadband subscriber, you may experience this data usage warning redirect to https://globebroadbandstatus.globe.com.ph page. It shows your remaining data in percentage and actual GB’s left of your account for the month. There’s an option also that you can top up additional bandwidth once you fully consumed you allowance via Volume Boost. Upgrade your Globe broadband DSL plan option is also available and customer support details that you can use as reference if your having problem with your account. This is an automatic redirect page that usually appears when your bandwidth usage reaches 60 to 80 percent. Based on experience, this page sometimes causes a problem with your internet connection. You cannot browse on some websites, but your internet works on Facebook, Google, etc. To avoid this problem, once the Globe Broadband Status redirects page prompt on your browser you need to click “Continue browsing” button. Another issue is when you have more network users connected on your Wi-Fi and one of them ignored the status page, your internet connection will now experience the browsing problem again. You will just notice that when you cannot open a specific page even if your modem status is working fine. 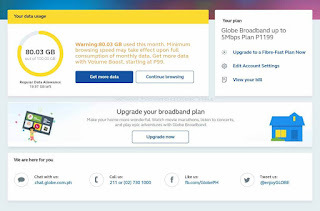 The prompt is random to any devices connected to your network, whoever is connected when you reached the certain percentage of your monthly bandwidth will get redirected to the https://globebroadbandstatus.globe.com.ph page. You may also check out to How to Check Globe DSL Internet Data Usage without calling their hotline. Advise you network users to click the Continue browsing button whenever it appears. Disconnect from the internet using your modem/router admin page (192.168.254.254). Sad to say Globe doesn’t provide us with dashboard page where we can monitor our daily usage. The redirect page is just a warning page with too limited information included. If you have other issues and inquiries, just call Globe hotline.